The City of Hart DPW Superintendent is Brad Whitney. Phone the DPW at 231-873-3100. The City picks up brush and yard waste beginning first Monday of April thru the last Monday of November. Check the Yard Waste Ordinance for guidelines on compliance. This ordinance is intended to define yard waste as being organic waste material generated from yards (i.e. grass/shrub clippings, leaves, weeds, flowers, garden/house plants); define brush as being tree/shrub waste generated from yards (consisting of limbs 6" or less in diameter and 4' or more in length); establish rules for leaf, brush, yard waste pickup; allow brush/yard waste delivery to the bins at DPW; prohibit placement of grass clippings in the street/road using a mower or blower and establish the season for leaf, brush and yard waste pickup. If you have questions concerning this ordinance, please contact either City Hall at 231-873-2488 or DPW at 231-873-3100. The City of Hart conducts brush, yard and leaf pickup throughout the seasons. Waste must be placed at the curb. • Brush Pickup: April through November, first Monday of each month. 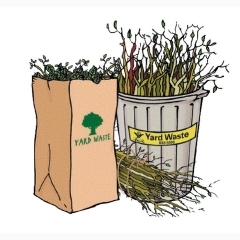 • Yard Waste: April through November, each Monday. Waste must be in recyclable bags. • Leaf Pickup: Third Week of October through November, as weather permits.